I never get sick of Buffalo chicken....EVER. If it were up to me, I would make it at least 3 times a week! 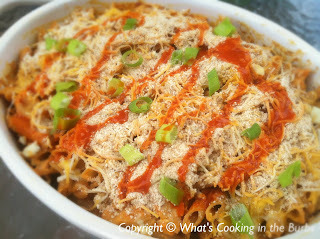 Well, it's been a while since I've made a baked buffalo chicken dish so I decided why not make one for dinner tonight. This delicious Buffalo Chicken Bake has all of my favorites combined with pasta and topped with cheese and bread crumbs. Bake it in the oven and serve with a green salad and you have the perfect dinner! Preheat oven to 375 degrees. Cook pasta just until al dente. In a medium sauce pan, over low-medium heat, add ranch dressing, blue cheese, 1/4 cup of the shredded cheese, garlic powder, salt, buffalo wing sauce, and yogurt. Whisk until cheese is melted and ingredients are combined. Spray a cooking dish and add pasta and chicken. Pour wing sauce mixture over it and mix until everything is well combined. Top with remaining shredded cheese and bread crumbs. Bake 25 minutes or until cheese is brown and bubbling. Top with green onions and additional wing sauce (Optional) Enjoy! I can't wait to try this, Bridget! Pinned! Your buffalo chicken looks delicious. Pinning this! Thanks for sharing at The Gathering Spot this week. when do you put the Blue Cheese in? You can either top it with the blue cheese crumbles or whisk it in with the ranch. thanks i did just that, both! Mixed it in and topped with it. Great dish. Bridget what is a serving size for weight watchers? How do you cook the chicken before using it in the recipe? Sounds delicious!!! Thanks! I've cooked a few different ways. Usually I will poach two chicken breasts and chop them up. I've also made the chicken ahead of time in the crock pot as well. Hope you enjoy! how much is a serving size? A cup or 1/2? Nevermind! I saw your previous comment! :) Cant wait to try! Thanks for the recipe my family loved it!! I'm so glad you all enjoyed it, Leslie! Can you use something other than Greek yogurt? I haven't had much luck cooking with it in the past. Just curious! Thanks. Absolutely. Cream cheese would work great or maybe try low fat sour cream?